Love has often been exchanged for vaguely defined and regrettable things, so it stands to reason that “love” will now be accepted as a form of payment for McDonald’s food. 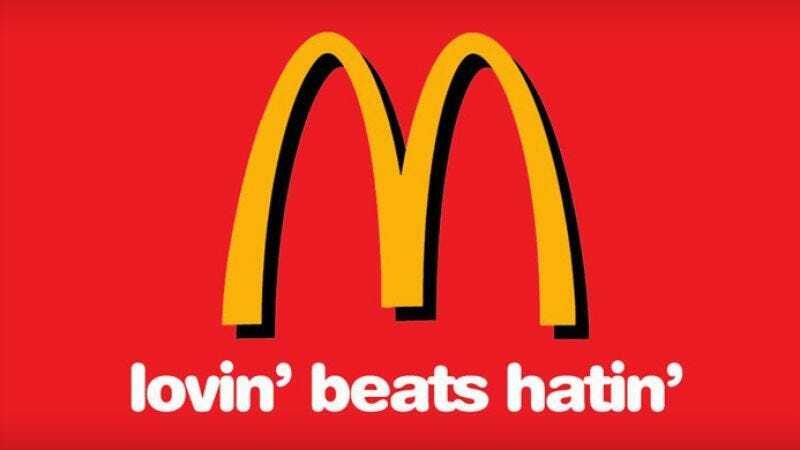 The company has released a preview of its upcoming Super Bowl ad, which follows on the heels of its new “Lovin’ Beats Hatin’” campaign—a push to remind Americans that too much hatred can fill you with bile, leaving you with hardly any bile left to dissolve a McDonald’s hamburger. Most recently, McDonald’s reminded everyone of the deleterious effects of being filled with hate by debuting a series of commercials positing the sign for the nugget dispensary as a shining beacon in times of tragedy, enraging millions. Now McDonald’s is ready to focus on the lovin’ part, creating the below TV spot that shows various customers being informed that they can pay for their sandwiches and sundaes with traditional displays of love—such as calling their mom, hugging their kids, or awkwardly dancing with a McDonald’s employee. Not everyone will receive lovin’. Instead, only certain people will even be deemed eligible. Those who don’t will wander through the McDonald’s wondering, “Why him? Why her? What’s wrong with me?” Satisfying answers will never be provided. McDonald’s employees and their families are not eligible for love. Lovin’ can only take place during a specific designated time (known as “The PWL Time”), which will also be randomly decided. This is not under your control. No amount of dropping hints or begging will get you lovin’ outside of PWL Time. That time will be determined by someone else—namely, each restaurant’s “Lovin’ Lead” manager. What gives them the right to say whether you’re worthy of lovin’? Why do they have so much power over saying when you can have it? These are delicate questions best not asked. What if you don’t feel like doing any of those things? What if you wish to express your lovin’ in different ways? What if that’s just how you show your lovin’, and it’s not your fault—it’s just learned behavior from your parents’ unhappy marriage and an unaffectionate childhood? That’s too bad. You have to think about your Lovin’ Lead’s needs now. Failure to show them lovin’ will result in “forfeit of Participant’s status as an unofficial prize winner.” You won’t get any lovin.’ You’ll be a loser. You can’t transfer your lovin’ to anyone else. It’s a monogamous arrangement between you and the McDonald’s manager. In exchange for winning lovin’, you agree to abide by the rules. That includes allowing McDonald’s to spread your name, likeness, voice, and anything else that might identify you as their lover throughout the world. They can also decide to take away your lovin’ at any time they want, with no explanation required. You can’t say anything about it to anyone. Don’t go telling people that McDonald’s is some kind of harlot, taking its love from everyone indiscriminately, serving up its goods to anyone who happens to walk in the door at PWL Time. They’re not having that. But they can still tell the whole world about you. In exchange for this, you get a free hamburger.